Yes that’s right, this blog has moved location. It’s become so popular and so awesome that we had to put it somewhere else and not on the basic WordPress.com hosting. There’s many reasons for doing this, mainly to make it even better! Just like the hundred minions carrying the house in this picture, I’ve worked hard at moving all the useful articles across that I and many others have written over the last 4 years (Wow! Has it really been that long?). The new blog will continue to have useful posts for all PBEM and play-by-post roleplayers. To make the blog better. The free account we had (this one you’re looking at right now) only allows us to choose from a few templates, and I have niggles with the presentations of each of them. Like the way the headings don’t quite have enough spacing, and the colours are all drab and dull. 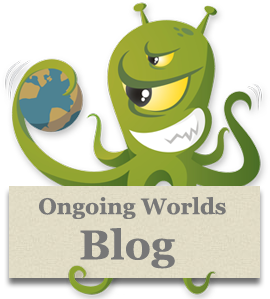 Moving to a proper hosted WordPress means I can choose from a million other templates, and make changes that will make it match the OngoingWorlds website so there’s no confusion when you go from there to the blog and go “what the hell is this? It looks all different!”. Also there’s more options for allowing other users to post to the blog. I’ve had some amazing people contribute articles to the blog, but unless they go through the complicated process of getting a WordPress.com account, the article looks like it was posted by me, and they don’t get the credit they deserve. Anyway, enough of the boring technical stuff which I’m sure you don’t care about. Check out the new blog here.